The last time President Abraham Lincoln and First Lady Mary Todd Lincoln sat for a portrait photograph together was in the early 1870s, five years or more after the president’s death and burial. The president, filmy and translucent, tenderly placed his see-through hands on his wife’s shoulders as she looked into the camera. Or so the photographs of William H. Mumler would have you believe. Mumler, the first documented spirit photographer, set up shop in Boston in 1860. He charged between five and ten dollars—a huge fee at the time—for cartes-de-visite featuring the customer in a family-portrait pose alongside spirits of his or her deceased loved ones. The pictures undoubtedly comforted sitters, who might be treated to the sight of long-gone mothers or lost children. Mumler claimed that this extraordinary effect flowed from his powers as a medium. He and other spirit photographers assured customers that while they might not be able to see the ghosts around them, the camera could. William H. Mumler, Mrs. French of Boston with her son’s spirit. Carte de visite (albumen print), c. 1868-70. Public domain via Wikimedia Commons. According to Louis Kaplan’s Grove Art Online entry on Mumler, “spirit photography must be understood in relation to the growth of Spiritualism,” a religious movement that had been gaining ground in North America and Europe since the late 1840s. Spiritualists, who usually considered their beliefs to be in accordance with Christian teachings, posited that it was possible for a soul to exist without a body. Additionally, these spirits could communicate with the living by making tapping noises, moving objects around, or controlling mediums’ speech. Media historian Jeffrey Sconce has suggested recently that new communication technologies in the 19th century, like the telegraph and the camera, further separated messages from the bodies of their senders, thereby either inspiring or providing support for Spiritualist beliefs. As the stop-motion experiments of Eadweard Muybridge later showed, scientists and artists were still figuring out the ways in which photographs differed from human sight. It’s not far-fetched that many people took seriously the question of whether or not cameras could see spirits, even though the average human eye could not. 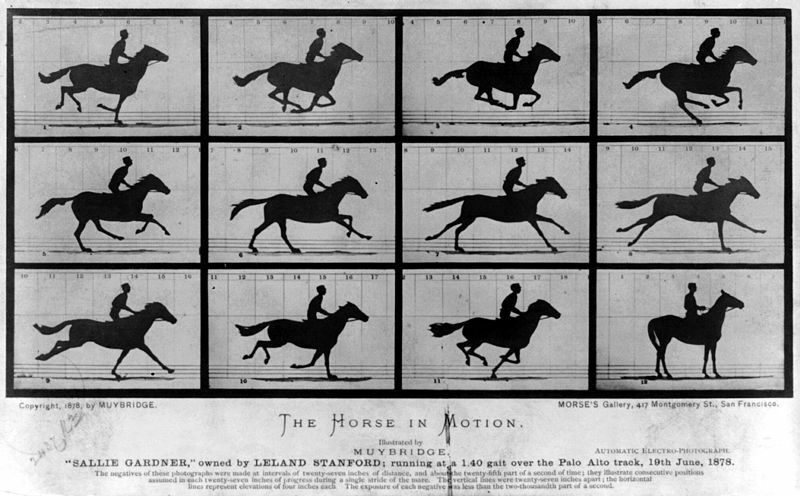 Eadweard Muybridge, The Horse in Motion. Automatic electro-photograph, 1878. Library of Congress Prints and Photographs Division via Wikimedia Commons. Others in the 19th and early 20th centuries found the idea preposterous and heretical, loudly condemning spirit photography as an elaborate swindle. At least a few of Mumler’s images are known fakes. He lost much of his credibility in Boston after a customer recognized the “spirit” in his portrait as a living resident of the city (to which he responded that he couldn’t help how the spirits chose to present themselves), and eventually relocated to New York. One might wonder why, if Mumler was repurposing the images of previous sitters as ghosts, more customers didn’t notice that the transparent figures accompanying them in their portraits weren’t their departed husbands, sisters, or children. During the American Civil War, thousands of portrait photographs were made, due in part to the separation of families and soldiers’ risk of death on the battlefield. Formats included the reproducible cartes-de-visite that Mumler used, as well as unique positives such as daguerreotypes and tintypes. But it’s still the case that most people in the mid-19th century weren’t ever photographed. All that the customers of spirit photographers had to rely on for comparison, then, were their memories and hopes. If a customer shared enough information with the photographer, and if the selected face was faint and blurry enough, the resulting “spirit” could convince a person who wanted to be convinced. Nonetheless, Mumler was accused of fraud and arrested mere months after moving to New York. Witnesses appearing at the highly-publicized hearing included prominent Spiritualists as well as skeptical photographers, who identified nine possible methods by which “spirits” could be imitated, including double exposure and combination printing. 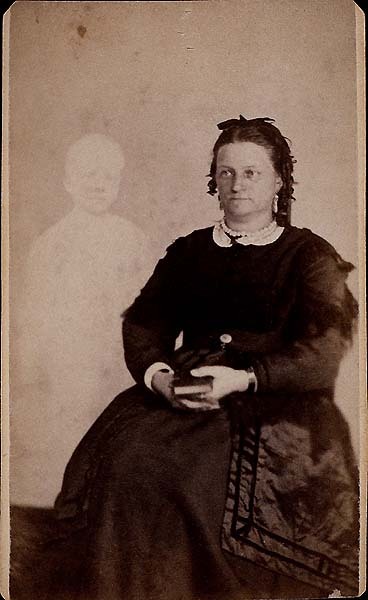 Constructing admittedly fake spirit photographs had already become a source of fun for some photographers, and witness Abraham Bogardus submitted one of his own as evidence. Taken at the request of showman P.T. Barnum, the image featured Barnum with the somber “ghost” of President Lincoln. Barnum was called to the witness stand as well, as an expert on “humbuggery.” He had previously railed against Mumler in his own writings, pointing out how some of Mumler’s ghosts were awfully fashionably dressed for having been dead so long. Mumler’s career declined, but spirit photography lived on in the work of other practitioners, whose work varied greatly in style and effect. Several writers have noted that the Civil War’s death toll likely fueled sustained interest in the subject. Another particularly productive period for mediums and spirit photographers encompassed the years during and after the First World War. Their focus, though, shifted away from portrait images of ghosts, which had attracted a great deal of skeptical baggage, and toward images of mediums in action. Albert von Schrenck-Notzing, Photograph of Eva C. showing fraud ectoplasm made from a Paris newspaper, Le Miroir. 1912. Public domain via Wikimedia Commons. However, the world may be as full of believers as it is of skeptics. More than one Spiritualist pointed out that just because some spirit photographs were fakes, that didn’t mean that the rest of them were. Others believed that there was more than enough evidence against the genre. The friendship between illusionist Harry Houdini and Sir Arthur Conan Doyle fell apart in the 1920s when Houdini made public statements deriding spirit photographs as farcical. Doyle, an ardent Spiritualist who had written a book in support of spirit photography, was crushed. The possibility of contacting his dead spouse and children was too great a comfort to him, as it had been to Mary Todd Lincoln fifty years earlier. Lincoln supposedly wept upon receiving William Mumler’s pictures of herself next to her husband. It was to the relief of some and the consternation of many that Mumler’s case never went to trial. Though the judge at his hearing plainly voiced skepticism about the matter, he also admitted that no one had actually figured out how Mumler caused his “spirits” to appear. To this day, his methods have remained a mystery. Kate Scott is a contributor to the Benezit Dictionary of Artists and a doctoral candidate in the Rutgers University Department of Art History, specializing in American art and the history of photography. Her blog, Images from American History, mines the artistic and visual culture of the United States for objects that shed light on the varying identities of the nation and its people.